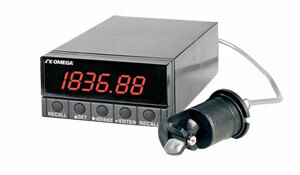 DPF5100 rate meter is discontinued. Please see the DPPT Panel Meter or DPF20 as a possible alternative or contact our Customer Engineering department for details. The DPF5100 microprocessor-based, 6-digit, 1 /8 DIN panel instrument can be configured by front-panel keys or by a personal computer as a frequency meter/ tachometer, frequency-ratio meter, period/ period-average meter, time-interval/ time-interval-average meter, reset stopwatch, and cumulative timer or totalizer/1-stage batch controller. However, the DPF5100 display cannot toggle between rate and total. Two signal inputs can be used to provide frequency ratio or time-interval measurements. In the frequency meter, the minimum display update rate is equal to 1 period of the frequency input. Thus, very low frequency measurements are displayed and updated faster than most conventional frequency meters. Only two sensors are required to measure the rate of a moving object. The DPF5100 can be set up as frequency-ratio meter, ideal for monitoring flow ratios. The DPF5100 can be set up as an up or down totalizer/1-stage batch controller at rates up to 7 MHz. The display capacity is –99,999 to 999,999 counts with exponential format up to 9.99 E9. Upon ac power loss, the latest reading is automatically saved in non-volatile RAM and is restored upon return of power.